Can I use the furniture, if the bathroom is small in size? 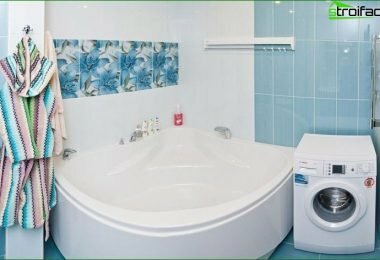 Typical bathrooms are sometimes so smallsize, the placement of the elementary sanitary equipment and washing machines can cause a lot of trouble. This is not to mention the furniture! And who does not want to see his bathroom was convenient? But is it possible, even in the room with small dimensions place mebeltakim way that it was not crowded? Let's start from the beginning. First, you can make a mirror with shelf more functionality. For this purpose, it can replace the mirror or the mirror cabinet with the side column. A washbasin with podstolya would be a good alternative to the conventional model. Now we get rid of things that only clutter the space and bring a minimum benefit. 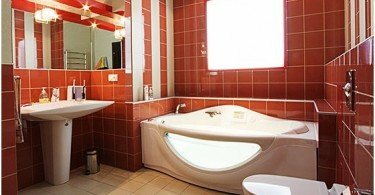 If you install the toilet in front of the bath, then in the corner make space for a washing machine, to be installed on the same line with the bathroom. A place on the machine can also be used for shelving, corner cupboard or hinged foam. 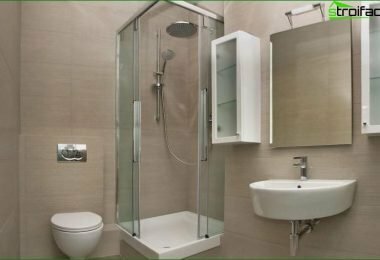 Availability is another option: You can use a shorter bath model, or even a shower tray. 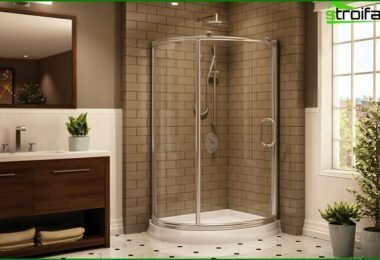 Available models are angular shower stalls with sliding doors - they can be used to better manage the limited space. Glass cockpit wall visually increase the space and shelves can become an ideal place for accessories. Some even prefer to install a shower bar, which is only a glass partition separates from the rest of the room space. In this scenario, the corner becomes the toilet, the tank it is placed on the same box, and that communication. Additional space can be obtained if, instead of a rectangular bathtub corner model used. And the remaining space can take a pencil box in which to store things. If your bathroom is located opposite the entrance,then to the right or left of the door can be placed furniture. A washing machine with front loading can be installed in front of sinks. A place above it may take a pencil case or rack, where you can store accessories. As seen, Bathroom small in size is not an obstacle for the simplest things. As a rule, sets of furniture for bathroomsincludes pencil box, mirror case, podstole, mirrors, cabinets and shelves. And if in the bathroom to place a small bright furniture, then this room will receive extraordinary beauty and ease. A bookcase made of chromed metal, which hold roller bearings, may be sliding containers. The space above and below the wash basinuse for business. The shelves and drawers podstolya comfortably accommodate bathroom accessories. Podstolya sizes typically range from 40 to 60 cm. It is better to buy, along with a sink. A transparent door can be very convenient - through them all can be clearly seen, but do not fall accessories bryzgi.Podstole can be done in the form of cabinets with pull-out containers or shelves. The doors can be hinged or folding. Stands for tables can be mounted or floor. 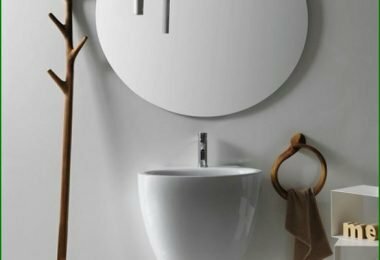 Suspended items get added protection from water, which often spreads in the bathroom on the floor, to the same room with them easier ubirat.Nad washbasin can be quite appropriate is a mirror cabinet with a depth of 15 cm. It can contain practical shelves and drawers, sometimes it placed lighting with a switch. If Bathroom small in sizeThen it will be quite appropriate narrowcupboards. As a rule, they are wide, from 20 to 60 centimeters, but their height sometimes reaching two meters. This decision will help a limited space to squeeze as much as possible benefit. Drawers or shelves are usually found inside of the canisters, and at the bottom is transparent or matte built-in door with laundry basket. Towel can be more functional if they are at the same time serve as a support for shelves with various small things. At the same time, they can rely on foldable bath screen made of Plexiglas. bathroom decoration can be a realart. And if she is also a small size, then everything should be left to chance. 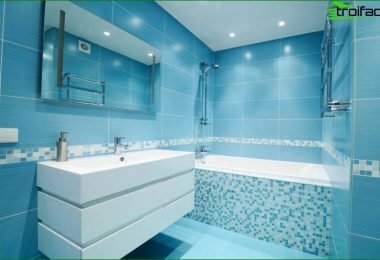 Properly using the form, light and color can be from a small bathroom to create a small masterpiece. A reward for your efforts will be bright, functional and aesthetically pleasing space in which there will always be a pleasure to be.